I treasure my Oakleys… they have a tough life, but they’re well cared for and they tend to not got replaced very often. So it was good to have some birthday money and to go shopping for replacements for my trusty blue-lensed Oakley Wires. 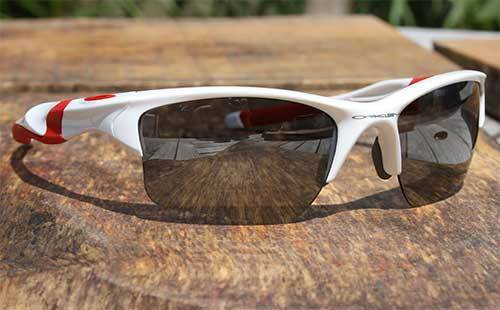 As I was in the market for a more leisure-orientated pair of shades, I managed to steer away from the top-end sports glasses and took a good look at the Half Jackets. Last year I had a pair of white Breos, which were much loved by me and Louis (age 12 at the time), but loathed by the rest of the family… but I was very keen to get some colour in the Oakley frames.Which made for a pleasant surprise when I was given the thumbs up for these Oakley Half Jacket 2.0 XL’s, in all their white and red glory. As you’d expect with Oakley, despite the straight arms, the glasses fit securely and are very comfortable for extended periods. I’ve worn them in the car for early morning and late afternoon commutes, with the sun sitting low in the sky for the 60-plus minutes of the drive. I also wore them at the weekend for the five-hour tour of Wiltshire on a Post Office bike and a couple of pubs as party of my birthday celebrations, and as aresult I’d be quite happy to wear them for sporting duties.